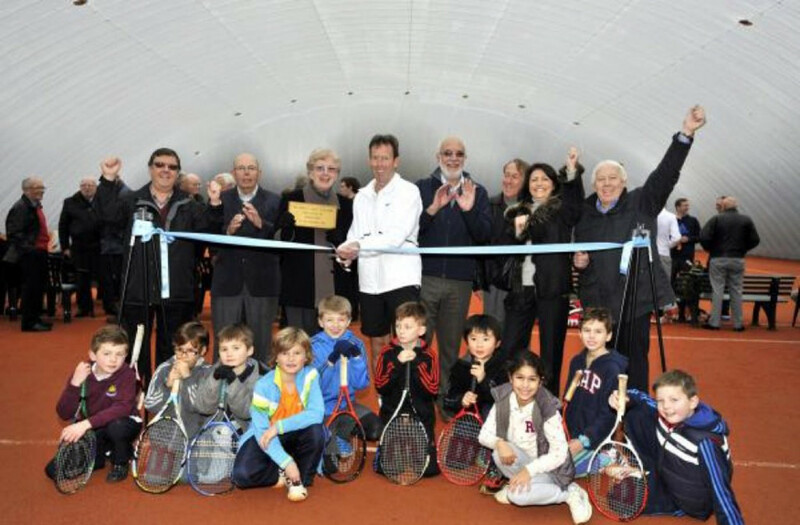 Billericay tennis club has officially ended its two-decade wait for indoor tennis courts. Former British number one Jermey Bates opened the three artificial clay courts and an air dome on Sunday. It marked the end of years of wrangling for the club in its bid to have indoor facilities. “It has been a dream of mine since I was a kid to belong to a club with indoor facilities and I have finally realised that dream,” said Les, who stood down as chairman on Friday after 25 years’ service. The £220,000 project was funded by an interest-free loan from Essex County LTA after Basildon Council councillors voted in favour of the development in December 2011. The club had been trying to get indoor courts built since it moved to its current home in Blunts Wall Road in 1997, but had failed due to the site being on green belt land. Bates endorses the Euroclay courts and joined 150 club members to open the new courts before playing a set with club coach Alex Rouse and teenage members Drew Gibbs and Jack Leggatt. Billericay is the only club in Essex to have indoor artificial clay courts, although Saffron Walden and Wanstead have outdoor artificial clay courts. The new courts mean Billericay now has three Euroclay and seven floodlit artificial grass courts.